ELKO, Nev. (AP) — Eight hikers and a sheriff’s deputy were escorted to safety from the top of a canyon at a popular Nevada recreation area as a wildfire spewed flames 100 feet (30 meters) into the air, authorities said Monday. Forest Service spokeswoman Erica Hupp said Monday no residential homes had been destroyed but some structures were lost. The official cause of the fire that was reported Sunday morning remains under investigation, but she confirmed it started near the Spring Creek shooting range at the base of the mountains. “The origin was in that area. We’re still trying to assess damage,” Hupp told The Associated Press. 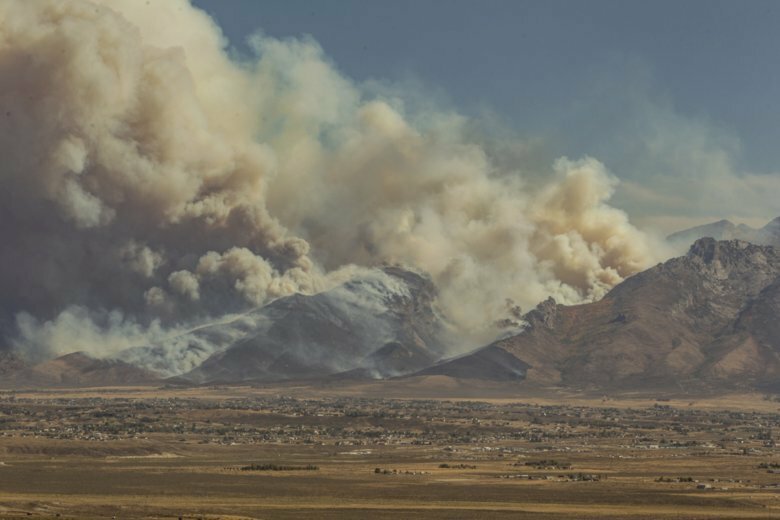 She said there’s no cell service in the Ruby Mountains’ Lamoille Canyon, which is surrounded by wilderness about 100 miles (160 kilometers) west of the Utah border so they’ve been unable to provide an update on the size of the fire. The service said earlier Monday it had burned an estimated 7 square miles (18 sq. kilometers). The 12-mile road (160 kilometers) from Elko to Lamoille Canyon remained closed. The recreation area also remained under an evacuation order and structure protection was in place in Lamoille along the base of the mountains. A California couple who saw homes destroyed in a wildfire near Santa Rosa a year ago was among the campers and hikers escorted to safety. George Tutwiler told the Elko Daily Free Press they had to avoid boulders that had fallen on the road Sunday night as they followed a caravan of eight to 10 other vehicles with a sheriff’s deputy and Bureau of Land Management official. Dixie Tutwiler said it was “exciting,” but she was worried that flying embers would land on their camper and set it afire. George Tutwiler said he became nervous when the caravan had to stop briefly near the exit of the canyon to wait for water trucks and first-responders to clear the road. He praised the firefighters and law officers for their quick response.